The title comes from a song in the camp episode of the fourth and final season where Brendon, Jason and Melissa go to Performing Arts Camp, it's a hilarious episode, and I thought it summed up the life of movie actors/directors. The layout uses the soundtrack cd image combined with a classic scene of Brendon, his mom, and his sister at their dining room table. I thought the normal evening coupled with his "other" side was perfect for the layout. Series Animators, Producers, Directors, and Creators. Show : Information about the show, including a little history with cast and crew credits. Episodes : Synopsis with episode stills. Music : Information on the music and soundtrack. Characters : Information on characters with episode stills. Images : Various images of merchandise and media featuring the cast. Graphics : Downloadable graphics for personal use, such as wallpaper, icons, etc. 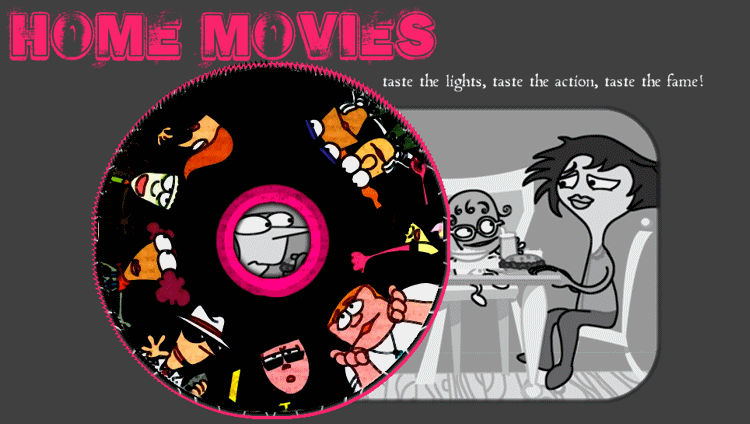 Fanlisting : The Home Movies fanlisting, info on how to join, using the codes, etc. Site : The site information found on this page.